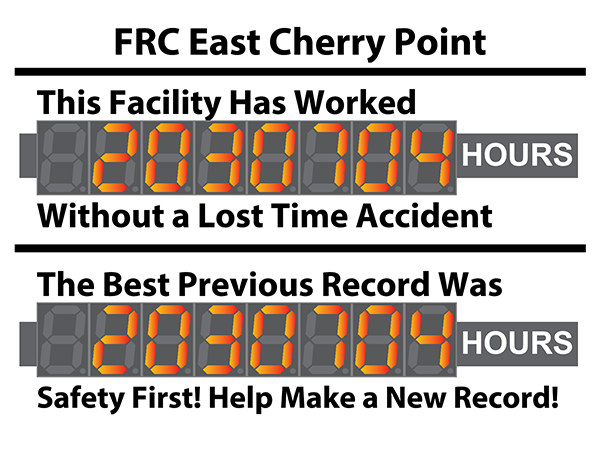 This digital safety scoreboard allows you to track the man hours worked since a lost time accident for two departments and is a great alternative to the typical day trackers. Accidents in the workplace are dangerous and lead to lost time and reduced productivity. Help raise awareness with this 36" high by 48" wide safety scoreboard with two eight digit counters that are 5" tall. The counters on this sign are not like any others on the market. The twelve 5" bright led digits can display your count in several different ways. They can be configured to count by a predefined value every minute, hour, or day. Show your number of man hours worked or count down the minutes until an event. Display Modes This display can be configured to show the count in a couple different ways, or you can choose to use it as a clock or calendar display.